We are among the trusted firms engaged in manufacturing, supplying and exporting a wide range of Compressed Air Aftercooler.These products are designed in compliance with international quality standards using the premium quality raw material, obtained from authentic vendors of the industry. We make these aftercoolers available to the clients in varied specifications, in order to stand effectively by their expectations. We are the leading manufacturers and exporters of high-quality Compressed Air Aftercooler. This is widely demanded these days for its easy installation and high performance. These are manufactured under the supervision of expert professionals who ensure that the product is in compliance with industry set quality standards. 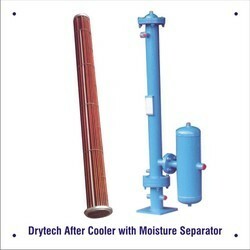 The offered coolers are precisely engineered by the experts of our organization and are widely utilized in large electric machines and other industries. Looking for Compressed Air Aftercooler ?